It’s 2018, and the world has come a long way in terms of technology. Today, AI (artificial intelligence) impacts numerous aspects of life in the form of smart devices, chatbots, and self-driving cars. All of these are designed to understand consumer needs and preferences and deliver customized customer experiences. AI has been a trending topic for quite a while now. And it is being used in various fields including digital marketing. This is mainly because the use of AI digital marketing strategies can help you deliver improved customer experiences. More than that, they can help you save both time and money. To put it simply, artificial intelligence refers to the intelligence showcased by machines. AI empowers machines to think about, respond to, and perform tasks like humans. It also helps machines learn from experience and adjust to new input. It increases precision and accounts for more accuracy and fewer errors, which means greater work efficiency. It analyzes more and deeper data for valuable insights. It can add to the capabilities of various devices with its smart, useful algorithms. GPS trackers, voice assistants, and home automation systems are just a few examples. It adapts to new input through progressive learning algorithms. With its exceptional ability to analyze data and learn from it, AI is revolutionizing industries. Several industries have a high demand for AI capabilities including medical, banking, and marketing. Let’s take a closer look at the future of AI digital marketing – the challenges, solutions, benefits, and adoption of artificial intelligence. From Google’s RankBrain and Voice Search to personalized Amazon recommendations, AI is changing the face of today’s digital landscape. With effective data analysis and the ability to adapt to input, AI is taking over the human role of identifying marketing trends. Brands and marketers are leveraging AI digital marketing to save time and resources through automated digital marketing services. Help You Understand Your Audience Better: AI can analyze data to easily predict the buying behaviors and decisions of your target customers. Improve User Experience: You can use AI data to provide your audience with what they actually need. More Effective Marketing: AI helps you end the guesswork. You can create a more effective marketing strategy for your business with AI’s data-driven analysis. Increase Productivity: Using AI algorithms, you can automate a number of repetitive tasks. This can help you increase productivity and save you both time and money. Increase ROI: AI empowers decision-making and also helps you create better-performing content. Implementing AI digital marketing strategies helps you reach out to the right audience with deals they can’t refuse. Are you still unsure about using AI? Let me tell you that 38% of consumers think that AI will soon improve customer service. And 73% of them are open to businesses that use AI. Using AI digital marketing strategies can transform the way you engage with your audience. It can help you drive relevant traffic, acquire new customers, increase sales, and retain your existing customers. Here’s how you can use AI technology to process your customers’ needs, wants, and preferences into personalized customer experiences. Chatbots are the biggest example of the use of AI technology. They act as a virtual assistant for consumers whether you ask Alexa to play your favorite song or Siri to set an alarm. There are several AI chatbot programs that can help you engage with your customers in a better way. You can add useful chatbots to your websites, emails, apps, and text messages. You can use chatbot programs to reach out to your customers or respond to their queries. They have the ability to answer the most common queries that your customers might have. And they can engage in human-like conversations that improve customer experience. For example, coffee giant, Starbucks, is making efficient use of AI digital marketing strategy to supplement human employees. 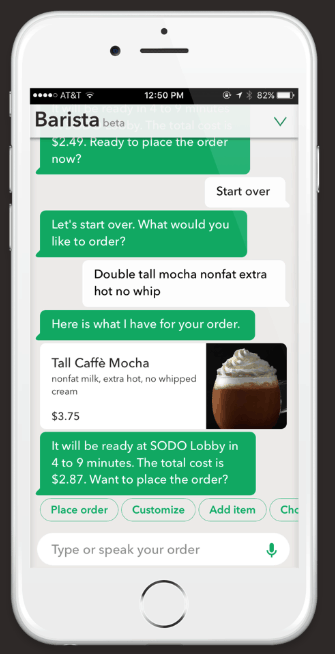 When you need your favorite coffee with minimal human interaction, the Starbucks Barista bot for Facebook Messenger has you covered. It orders you coffee, just the way you like it. Many retail and ecommerce brands use AI technology to track their customers’ preferences, habits, and buying behavior. These insights help them make suggestions on products and services that their customers may be interested in. Knowing your customers’ buying habits can help you craft a more effective marketing strategy. You can promote products that your customers may actually want to purchase. AI digital marketing and data analysis strategies are far quicker and more accurate than any human capability. It empowers you to personalize the user experience for your audience, engage them, and increase ecommerce sales. Ecommerce giant, Amazon, uses AI-powered recommendation engines to effectively provide personalized suggestions. These recommendations play a vital role in scaling up sales and contributing to their revenue growth. Amazon’s recommendation algorithms consider their users’ buying history, items in their cart, items they’ve liked, and what other users bought or viewed. Artificial intelligence is an incredible technology that can work wonders for your brand. Using AI digital marketing strategies will help brands deliver improved customer experience and do more effective marketing. It will also ensure faster problem-solving for consumers. If you benefited by the use of AI technology in any of your digital marketing efforts, let us know about your experiences in the comments below.